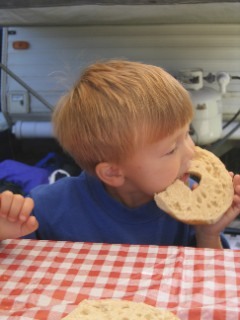 In the summer of 2003, when N was 2.5 years old, we learned that he had a life-threatening peanut allergy. I ate loads of peanut butter during pregnancy and lactation for added protein. He had terrible eczema and was likely reacting to the peanut protein in his breast milk. He wouldn’t touch peanut butter which should have been a red flag. So one day, when I was shopping at the health food store, my two boys wanted to try the food samples. I gave a graham cracker with peanut butter to B and a plain graham cracker to N. They held hands as they walked to me afterward. Following the health food store visit, we went to Burger King. (Do I have to admit this? We actually never eat fast food anymore.) When we sat down, I looked into my young son’s face and saw red, angry hives all around his eye. He must have rubbed something into it. I also smelled a strong perfume-like smell on his hand (I don’t wear perfume) so I wasn’t sure what caused it. We treated his reaction with an antihistamine and promptly made an appointment with the allergist for a full work-up that summer. Lucky for all of us, N never managed to ingest peanuts so he never had an anaphylactic reaction. The work-up revealed that N had a life-threatening peanut allergy. Unfortunately, N’s peanut allergy remains life-threatening today. We have faithfully carried Epi-pens with us over the years. He did have an anaphylactic reaction at diabetes camp once when he was 9 years old. It happened in the middle of the night and we still don’t understand why. When N was about 4 years old, his growth slowed and his energy level was very gradually declining. His belly seemed distended and the fat on his body wasn’t as firm as it should have been. Our pediatrician suspected celiac disease and ordered lab work. N was diagnosed with Hashimoto’s thyroid disease and his blood level suggested that he could have celiac as well. He had a biopsy which confirmed the diagnosis. N was referred to his current pediatric endocrinologist for managing growth and thyroid. The diabetes diagnosis came a year later. He perked up right away on a gluten fee diet. Everyone noticed the difference! Finding appropriate food was a huge challenge but reading labels for peanut allergens had warmed me up for the task of finding gluten-free food. Initially, I spent hours reading labels in the health food store. It was difficult to determine if a food was gluten free! Today it is much easier — but not easy. While eating out can be quite challenging, we have found some wonderful restaurants. N is learning how to communicate his needs when dining out. He has become quite a label reading expert as well! 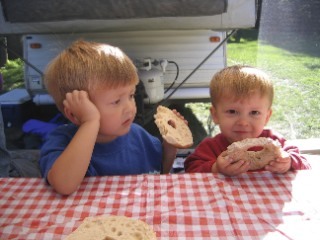 Eating a bagel, days before the biopsy for celiac disease. We were instructed to have N keep eating gluten.